Enjoy a holiday full of relaxing moments and outdoor experiences at Haus Katja in Salzburger Land – awarded with 4 Edelweiss. Our house is situated in quiet Location in the Moadörfl disctrict of the resort of Wagrain-Kleinarl. Choose from comfortable, new apartments sleeping 2 – 7 persons or modern country-style rooms with breakfast buffet sleeping 2 – 3 persons. Our guests feel particularly at home in our new panoramic breakfast room, in the lovely spa area, on the sun terrace and in the garden with barbecue. 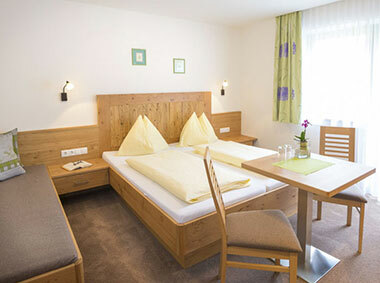 The high-quality equipped rooms and apartments in Haus Katja in Wagrain invite you to relax and unwind. In addition our guests can enjoy fabulous views of the surrounding countryside from our panoramic breakfast room. Light and airy triple and double room of 25 m² in size with balcony and bathroom with shower/WC. Set yourself up for a great day in the Salzburger Sportwelt at our sumptuous breakfast buffet. New, fully-equipped apartments sleeping 2 – 6 persons with balcony. Select from the spacious, 85 m² apartment with 3 rooms and 2 bathrooms or cosy studio of 35 m² in size. 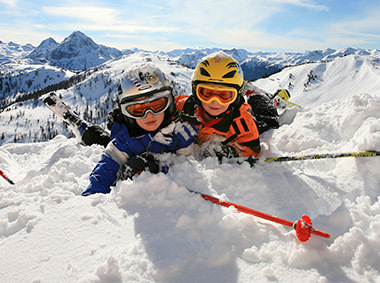 A ski holiday in the heart of the Ski Amadé in Salzburger Land. A quiet location right on the Tauern cross Country ski trail. Just 3 minutes walk from the “Roter 8-seater cable car in the Wagrain-Kleinarl ski area. A free ski bus for hassle-free skiing is right next to our house. 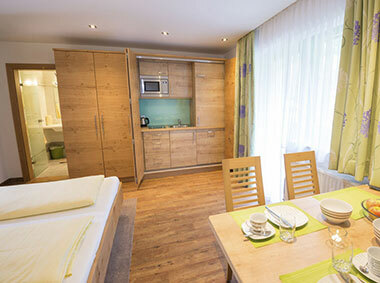 Whether you choose a summer or winter holiday – Haus Katja offers a great base for a variety of leisure activities and a number of sights & attractions in the vicinity. In the summer explore the picturesque mountain landscape on the wealth of footpaths and mountain bike trails, which lead right past our house. In winter access to great skiing is right nearby – in just 3 minutes wall you reach the Rote 8-seater cable car, which constitues the centre of the 3-valley ski circuit of Flachau – Wagrain – St. Johann/Alpendorf in the Ski Amadé ski area. The Tauern cross country ski trail is just a couple of pole lengts away from Haus Katja. As our guest you can enjoy daily 1 free admission (in winter 3 hours, in summer 1 day ticket – on rainy days 3 hours) to the Wasserwelt Wagrain swimming pool on production of your guest Card.